Wellington, Florida – January 28, 2019 – The Palm Beach Masters Series ® is delighted to welcome an outstanding group of sponsors for its expanded 2019 show series. The 2019 Palm Beach Masters Series ® will again host the top horses and riders from across the globe, as they compete for more than $1 million in prize money at three of the most prestigious competitions in the nation. Held at the spectacular world-class Deeridge Farms in the heart of Wellington, FL, the 2019 Palm Beach Masters Series ® consists of the CP Palm Beach Masters Winter Classic CSI4*-W Presented by Suncast , featuring the Longines FEI Jumping World Cup™ Wellington (Jan. 31-Feb. 3); the Longines FEI Jumping Nations Cup™ of the United States of America CSIO5* (Feb. 14-17); and the Deeridge Derby (Feb. 28-March 3). Longines is the Official Timekeeper and the Official Watch of the Longines FEI Jumping World Cup™ Wellington and the Longines FEI Jumping Nations Cup™ of the United States. Longines’ passion for equestrian sports dates back to 1878, and its partnership reinforces the traditional and long-lasting commitment of the Swiss watchmaker in equestrian sports. The $208,200 Longines FEI Jumping World Cup Wellington is the penultimate east coast qualifier of the Longines FEI Jumping World Cup North American League. As the featured class of the 2019 CP Palm Beach Masters CSI4*-W, the competition will take place Sunday, February 3 at 1:00 p.m. ET. Canadian Pacific (CP ) returns to Deeridge Farms with its title sponsorship of the CP Palm Beach Masters Presented by Suncast. Canadian Pacific is renowned for its transportation services and supply chain expertise, with access to eight major ports and key markets across North America. The $35,700 CP Welcome Stake will be held Thursday, January 31 at 3:00 p.m. ET. Suncast® is the Presenting Partner of the CP Palm Beach Masters. A market leader in custom wood structures and high-quality resin products made in the U.S., Suncast designs, develops, and manufactures stylish products with practical features for the whole home. The $71,200 Suncast Palm Beach Masters Qualifier takes place on Friday, February 1 at 1:30 p.m. ET. NetJets® has been the world leader in private aviation for more than a half-century, pioneering the shared aircraft ownership concept. Providing an unsurpassed VIP aviation experience, NetJets ® flights and operations have expanded to approximately 700 aircraft world-wide. No other private flight provider comes close to their global reach, commitment to safety, and attention to detail. NetJets ® maintains an ongoing commitment to equestrian sports in the U.S. as title sponsor of the U.S. Show Jumping Team. In addition, the$71,200 NetJets ® Classic will take place Saturday, February 2, at 2:00 p.m. ET. Recognized for its entrepreneurial approach and distinctive culture, Berkshire Bank is one of Massachusetts’ oldest and largest independent banks and the largest banking institution based in Western Massachusetts. The best viewing for the 2019 Palm Beach Masters Series ® will be from the Berkshire Bank VIP Club, a luxurious two-story destination to watch the competition in both the grass jumping field and all-weather sand arena. The Club will feature exquisite culinary creations crafted by the renowned Patina Group, a complimentary bar and table service. Hospitality packages include a reserved table for six seated guests, along with an option to add up to four additional guests each day and preferred parking. For more information and to reserve a table, click here . Engel & Völkers Wellington is located in the heart of South Florida’s largest equestrian community and represents a distinct brand of exceptional real estate service and international reach. Owners Amy Carr & Carol Sollak have more than 20 years of experience working with clients who are buying, selling, or leasing properties in the area. EquiJet is leading equine transport company. Offering a vast network of partner companies to ensure safe shipping for equines across the globe, the EquiJet team prides itself on offering clear, logistical solutions to riders and owners anywhere in the world. The Hampton Classic is the prestigious culminating event of the Hamptons’ famed summer season. From August 25 through September 1, 2019, top show jumping and show hunter riders from around the world will compete for some of the richest prize money in the nation. The Hampton Classic hosts more than 100 competitive classes throughout six rings for horses and riders of all ages and abilities. The show also features a Boutique Garden with more than 70 vendors, a wide selection of dining options and a Farmer’s Market, all on its 60-acre show grounds. The $4,000 Hampton Classic Gold Championship Tour at the Palm Beach Masters Series ® takes place Saturday, February 2 at 9:00 a.m. ET. Rood & Riddle began as an ambulatory practice in Lexington, KY, in 1982 and established a full-service equine hospital in 1986. Today, the practice is known and respected throughout the world for its innovative and highly skilled treatment of horses. Rood & Riddle continues its tradition of excellence into the 21st century, serving as a referral center for horses requiring specialized medical and surgical care and providing ambulatory care for all breeds and disciplines. With the original hospital in Lexington as well as satellite hospitals in Saratoga Springs, NY, and Wellington, FL, Rood & Riddle maintains an unwavering commitment to quality, both in the care of horses and in their relationships with clients and the community. Turkish Airlines is one of the leading, most preferred European air carriers with global network coverage. Thanks to its strict compliance with flight safety, reliability, product line, service quality, and competitiveness, it proudly maintains its identity as the flag carrier of Turkey. The CP Palm Beach Masters Winter Classic CSI4*-W Presented by Suncast ® will showcase exhilarating competition from start to finish. The week’s featured event is the Longines FEI Jumping World Cup™ Wellington , one of the final two East Coast qualifiers in the Longines FEI Jumping World Cup ™ North American League (NAL). Many of the sport’s biggest names will vie for top prize money and a chance to qualify for the 2019 Longines FEI Jumping World Cup ™ Final in Gothenburg, Sweden. Click here for the Schedule. 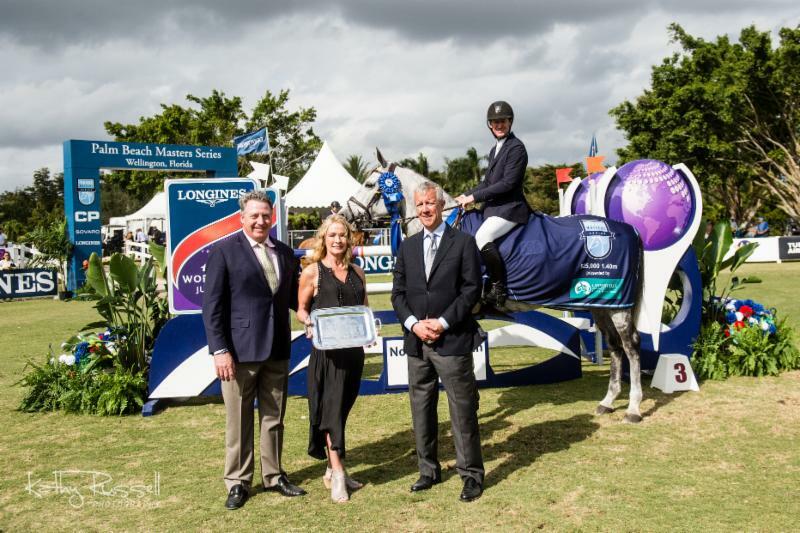 The Palm Beach Masters Series has been selected to host the 2019 Longines FEI Jumping Nations Cup™ of the United States of America , a CSIO5* competition which will be hosted annually at Deeridge Farms through the year 2021. The Longines FEI Jumping Nations Cup ™, celebrating its 110th year in 2019, features international teams made up of the world’s most talented horses and riders. The Nations Cup at Deeridge Farms will be the only qualifier in the U.S. for the 2019 Longines FEI Jumping Nations Cup™ Final that matches the top qualifying teams from around the world. The Nations Cup at the Palm Beach Masters Series ® will also include FEI Jumping Nations Cup ™ Youth competition for Young Riders, Juniors, and Children, showcasing the next generation of elite show jumping talent. Returning for its third year is the Deeridge Derby , a USEF nationally rated show where the nation’s most elegant show hunters take will center stage. They’ll compete in prestigious classes, highlighted by the highly competitive $50,000 USHJA International Hunter Derby. The best viewing for the exciting 2019 Palm Beach Masters Series is from the Berkshire Bank VIP Club,an exquisite two-story venue for watching the top-level competition in either competition arena. Club members are treated to special amenities and a one-of-a-kind culinary experience; hospitality packages include a reserved table for six seated guests with the option to add up to four additional tickets. Gourmet food is provided throughout the day, along with a complimentary open bar and table service. For more information and to reserve a table, click here . Events are hosted at the spectacular Deeridge Farms, situated in the heart of North American equestrian sport in Wellington, Florida. Award-winning landscaping surrounds the custom-built show grounds and the facilities that host the series, which include two masterfully-created competition arenas – a Grand Prix turf arena and an all-weather sand arena. Additionally, there are two Bermuda grass schooling arenas—one designated for FEI and the other for non-FEI competitors—along with an all-weather schooling arena adjacent to the competition arena and another located near the stables. New in 2019, the grounds will feature a boardwalk lining the sand ring, which will feature boutique shopping and a restaurant open to the public. The Palm Beach Masters Series ® invites spectators to take in the excitement of world-class equestrian sport free of charge. Parking and general admission seating in the grandstands are available on a first-come, first-serve basis for the Longines FEI Jumping World Cup ™ Qualifier, Nations Cup USA and Deeridge Derby.Click here for information and directions.